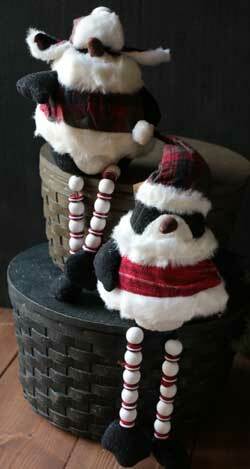 Christmas dolls perfect for the rustic, country, primitive, or folk art holiday decorating! We have Honey & Me, The Hearthside Collection, Hanna's Handiworks, You Heart's Delight by Audrey's, and more! 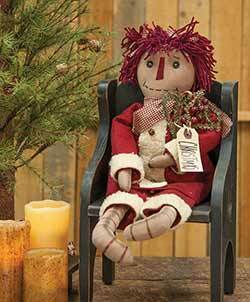 This sweet, raggedy Christmas doll is wearing a red felt santa like suit, and she hold a bunch of greenery sprigs and red berries. 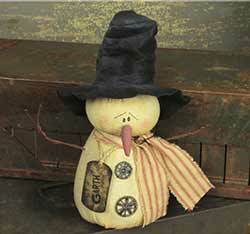 Garth H. Gear Snowman - a grubby yet sweet little snowman with top hat, gear buttons, and a little name tag. Gingerbread Doll, by Honey and Me. 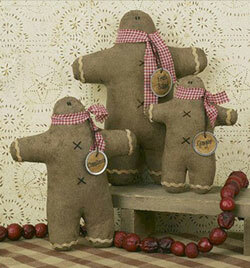 Very primitive stuffed gingerbread doll decorations, with homespun fabric scarves and tea-dyed tags. 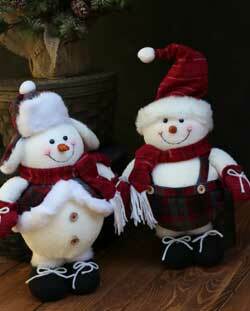 Sold individually - choose from the Small (5 inches), Medium (7 inches), or Large (9.5 inches) doll. 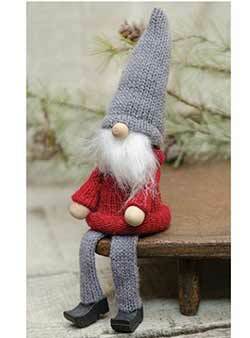 Made of wool and wood, this grey and red gnome shelf sitter doll has dangly legs that can hang over the edge of a surface. 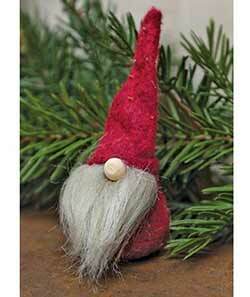 This sweet mini gnome has just a large stubby nose peeking out from his red hat and bushy grey beard. 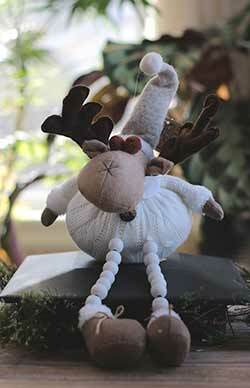 Great little doll for decorating a mantel or shelf! 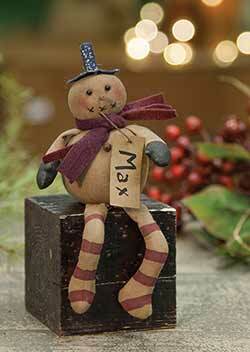 Mini Max is perfect for tucking into a country primitive tree, or sitting on a shelf or mantel! 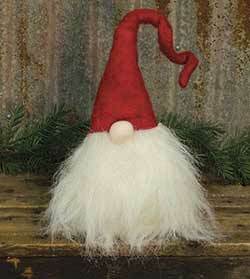 This sweet mini gnome has just a large stubby nose peeking out from his red hat and bushy white beard. 7 inches tall. 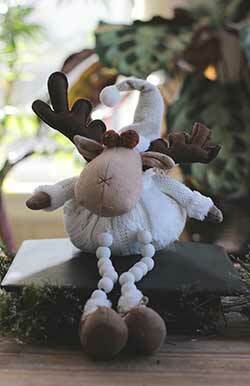 Moose Winter Fleece Stander, by Hanna's Handiworks. 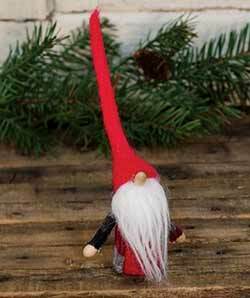 Legs expand to vary the height of the figure - can stand between 19 and 25 inches tall. 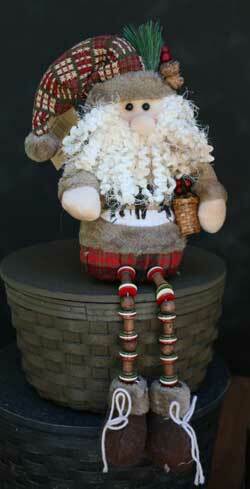 Made of knit fabric, jute ribbon, twigs, buttons, felt, etc. Other stuffed figures also available! Has a weighted base for sitting securely on a shelf, and button/bead legs that dangle. 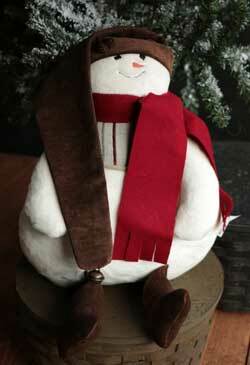 This is the Mr. Moose version, with a white scarf. 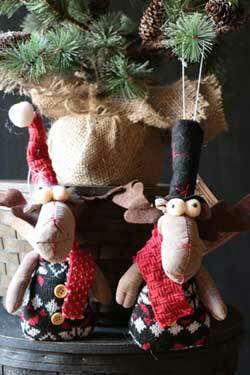 Sold individually - Choose the Left or Right Moose figure. Has a weighted base for sitting securely on a shelf, and button/bead legs that dangle. This is the Mrs. Moose version, with a scalloped collar. 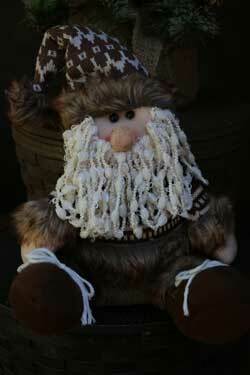 With his big bushy beard and stubby nose, this little Santa gnome is sure to add character to your Christmas tree! 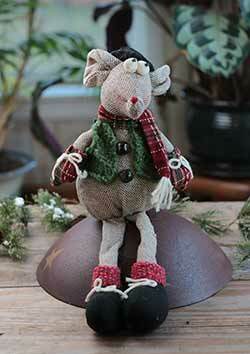 Sit one of these darling stuffed mice on a shelf or mantle, or hang in a tree! Sold individually - Choose the mouse on the Left (red scarf) or the Right (green scarf). 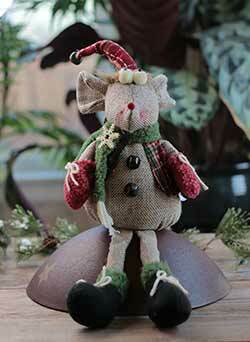 Set this darling stuffed mice on a shelf or mantle! 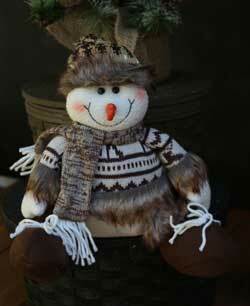 This one wears a green scarf, plaid vest, and matching plaid stocking hat. 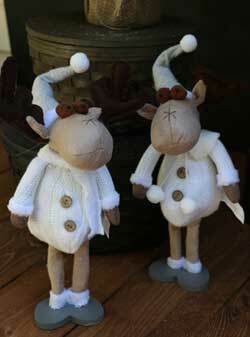 Set this darling stuffed mice on a shelf or mantle! 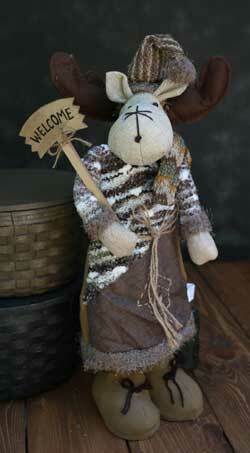 This one wears a plaid scarf, green vest, and black felt top hat. 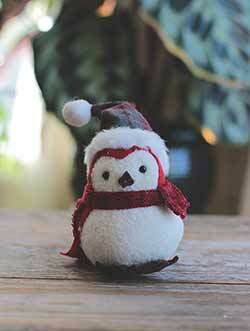 Add a spot of color and charm to your rustic holiday decorating with this cozy cabin bird, wearing a red knit beanie hat! 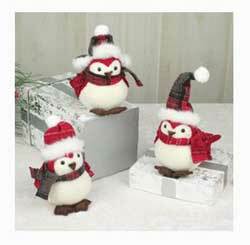 Add a spot of color and charm to your rustic holiday decorating with this cozy cabin bird, wearing a grey and red earflap hat! 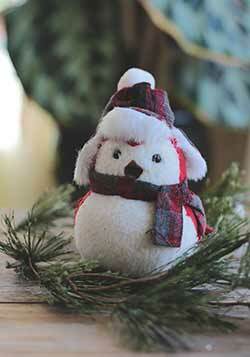 Add a spot of color and charm to your rustic holiday decorating with this cozy cabin bird, wearing a grey and red plaid stocking hat!